The Mistletoe Christmas Card is folded in half — and half again — and tied with a gold ribbon; what could be simpler? The Mistletoe Christmas Card is shown with dotted lines indicating the two folds. This delightful scene is not only filled with beauty, but tenderness: The Virgin holds her Newborn Baby Jesus close to her heart, and a young angel — half hidden behind a column — shyly reaches out to hold the Babe's hand. Three other angels surround the manger, and the rays of an unseen star illuminate the darkness. ThisPremium Downloadcontains the print file and the simple instructions — fold in half and half again! — needed to create theMistletoe Christmas Card. 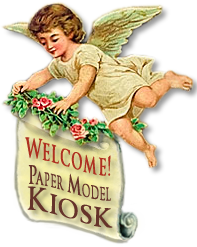 Just one piece of letter-sized paper is required, and I like using Epson Matte Heavyweight. After trimming the excess white areas, score along the two dotted lines (shown in the folding diagram, above), and you've created yourMistletoe Christmas Card. Tie a strand of gold thread or ribbon, as shown in the large images, at the top of the page, and add a special touch to yourMistletoe Christmas Card. Another nice touch — I have many such vintage cards in my collection — would be to print the Front?Back and Inside pages of your card on different weight paper: heavier for the front and back, finer for the inside pages. Fold the two pieces (as shown at top of page) and apply a bead of glue between them and and a strand of gold. It's all so simple, even a child could do it! 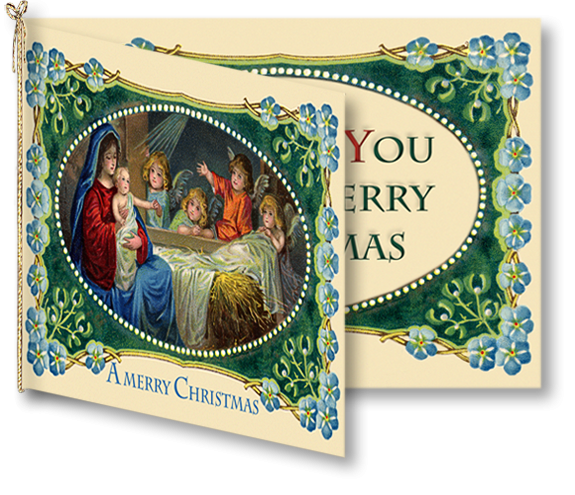 Buy Mistletoe Christmas Card as part of a collection, and save!